Follow the link Product features. Click on the button Add feature on the right side. Name – specify the manufacturer name. Position – specify the feature position. Description – specify the feature description (it will be displayed if the customer will click on the link “?”) in the tab Features. Type – choose feature type in the section Select-box. Group – choose the group, which this feature will be applied to (in order not to apply feature to any group, select None). Product – choose if you want feature to be displayed in the product details pages. 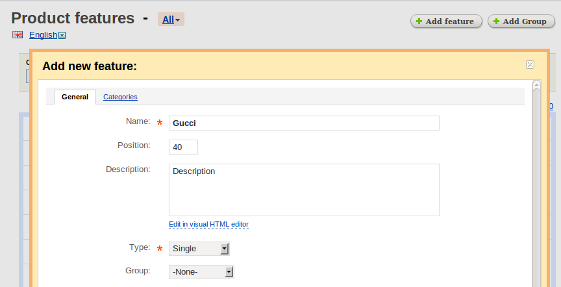 Catalog pages – choose if you want product feature to be displayed on the product list pages. Prefix – specify the feature prefix. Suffix – specify feature suffix. Open the tab Variants and add information about the necessary manufacturer. Choose the manufacturer you need in the Manufacturer feature list. "Knowledge wants to be free, just like these atrclies!"